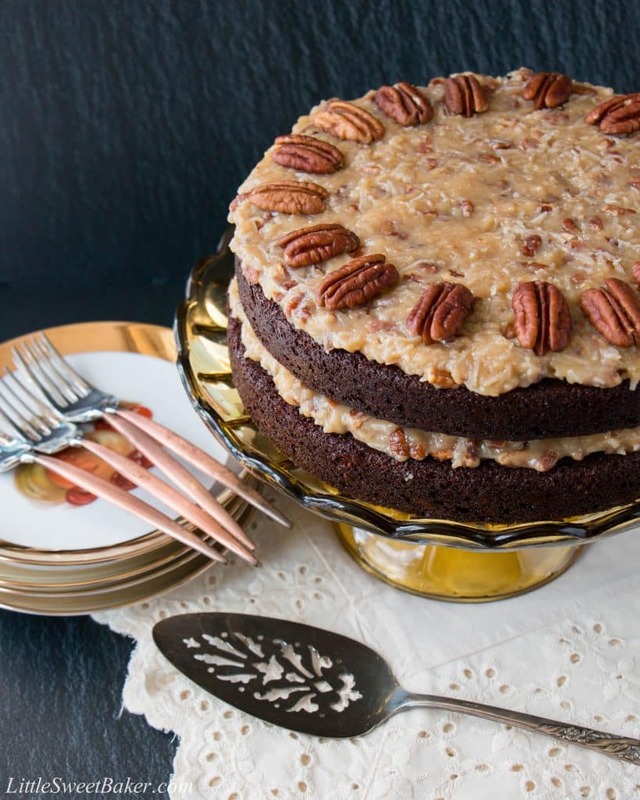 This is a classic German Chocolate Cake made with a moist and delicious chocolatey cake and a rich coconut-pecan frosting. 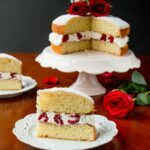 It’s spectacular and indulgent with its fudgy cake layers, and its sweet and gooey nutty frosting. I remember my first taste of a German chocolate cake. It was many years ago at a friend’s house, but I still recall very clearly that sweet coconut pecan frosting and deep-dark chocolate cake. I remember savoring the chewy texture of the shredded coconut and how the sweetness lingers on your palate along with a slight bittersweet chocolate taste. As you can tell, that cake obviously made an unforgettable impression on me. With the American Thanksgiving and Christmas holiday coming up, we have many special events to get ready for. And this cake is definitely well suited for any special occasion because of its classic appeal, indulgence, yet simplistic charm. The cake itself is soft, dense and very chocolatey. The frosting is sweet with a creamy milky flavor. It’s nutty with the taste of coconut and soft scent of vanilla. This German chocolate cake is perfect for making holiday memories with good friends and family. This is a classic German Chocolate Cake made with a moist and delicious chocolatey cake and a rich coconut-pecan frosting. Divide the batter into the prepared baking pans and bake for 30-32 minutes or until a toothpick inserted into the center comes out clean. Let cool completely before frosting. In a medium saucepan, stir together the egg yolks, sugar and evaporated milk. Add butter and cook over medium heat, whisking constantly until mixture thickens (about 10-12 minutes). Remove from heat, stir in the coconut, pecans and vanilla. Let cool for 30 minutes before spreading over cake. Cake recipe from Cooking Classy and frosting recipe from Betty Crocker. I baked this for my family and everyone was moaning at how good it was the whole time they ate it. 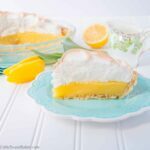 Thank you for such a fabulous recipe! I baked this for co-workers retirement party and so many people asked me for the recipe. The cake was so moist and absolutely amazing! Aww, how nice of you and thank you for your kind words. I’m glad everyone enjoyed it! 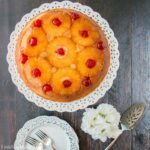 Seeing this post is very timely since I am looking for a cake to bake for this New Year’s Day Celebration. It looks really delicious and I can’t wait to try it. Wish me luck. I made this on Sunday for our dessert, expecting there be some left over for Monday, but… nope… it was devoured. So delicious. I hope you enjoy the cake and have a great day! Hi there again! Do you think I could make this in a 13×9 instead of the 2 rounds? If so would I change temp or time? I appreciate your input and must say I like the idea of using unsweetened coconut, as I then have the choice to skip the sulfites that are used in the sweetened variety. For a 13×9″ pan, bake at the same temperature for 30-35 minutes. I too, much prefer unsweetened coconut. I hope you enjoy the cake and have a great weekend! Lily, I finally made this luscious cake! Family loved it’s moistness and dreamy yet not too sweet frosting! I never made a German chocolate cake before but this is a keeper! I did end up making it in the 13×9 aluminum pan and it took 42 minutes as for some reason a rectangular section in the middle was reluctantly rising and baking with the rest. It caved in a little in that section once cooled but the frosting covered it nicely. My oven temp was right and my leaveners fresh so why do you think I had that issue Lily? The only tweak it made to the cake recipe was adding 1 tsp. Instant organic coffee to the hot water to bring out the chocolate flavor…I used Hersheys natural (undutched) cocoa powder—should I have used a dutch processed with alkali cocoa? Regardless of looks, we all loved the moist and rich cake and frosting and I thank you for your wonderful recipes you share with us! I think the cake might have been slightly underbaked or that batter might have been slightly over-mixed. That’s my guess. The cocoa powder shouldn’t have any effect. I’m glad you still enjoyed it though and happy holidays to you and your family!